The original Mini was renowned for delivering a fun driving experience without breaking the bank. However, early examples of the classic Mini Cooper S are becoming more desirable and have significantly increased in value in the used car market. Case in point: someone in the UK recently shelled out over $25,000 for this 1965 example that will require a lot of restoration work make it roadworthy. 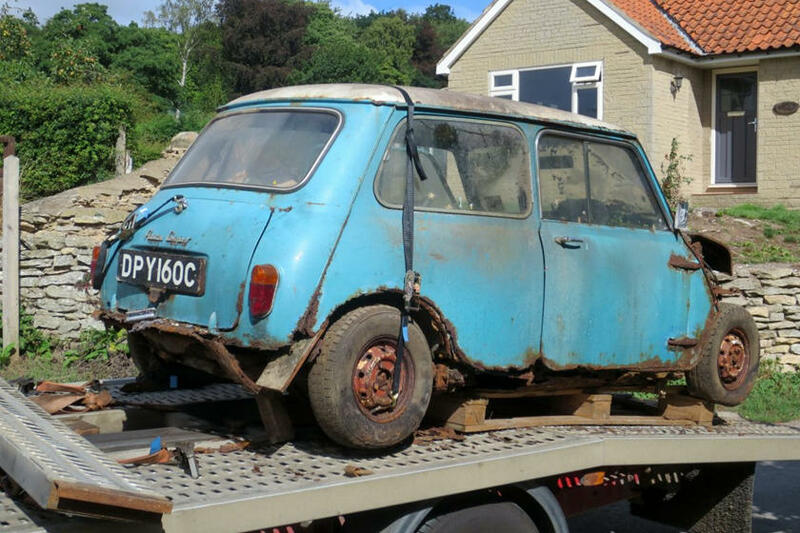 According to The London Economic, the rusted Mini has essentially been left to rot in a garage since 1978 when the roof collapsed, completely dismembering the front of the car. The engine doesn't run, and the car will need a new body and a full restoration. The car was only expected to fetch between £3,000 and £10,000 ($4,000 and $13,000) when it went up for auction with no reserve by Mathewson. "It is unusual but was not tremendously surprising," said Derek Mathewson, head of Mathewson auction house to The London Economic. "The Mini had been parked in the garage of a 1930s home for the past 40 years. Over the years the garage roof had collapsed and the Mini essentially became a shed within a shed, with the boot and rear used to store kindling. But despite the condition, it is a genuine Mini Cooper S which is why there was so much hullabaloo." The car was sold for £20,000 ($26,000) including fees, which seems like a lot for a humble Mini hatchback. Years ago, it would have been sent to the junkyard, but the fact it's an authentic 1965 Mini Cooper S instantly makes it valuable even if it's in woeful condition.